Anyone Wants This Original Apollo XI Mission Patch Flown the Moon? This original Apollo XI mission patch actually flown to the Moon by Michael Collins will be for sale this Thursday. 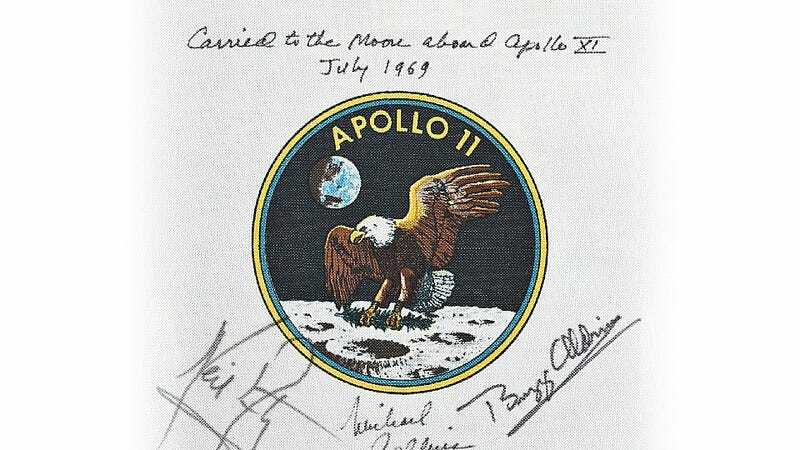 It's signed by Collins, Aldrin and Armstrong. It's printed in Beta cloth—the fireproof silica fiber cloth used in Apollo space suits. I certify that the enclosed 6" x 6" Beta cloth Apollo XI crew patch, signed by Neil Armstrong, Buzz Aldrin, and myself, is from my Personal Preference Kit flown to the moon in 1969. All three signatures date back to 1969. I added the inscription at the top approximately 25 years later. Michael Collins, Apollo XI CMP.